Longer trains running more frequently and later into the night have been announced to help get more than eight million people to the 2012 London Olympic venues. 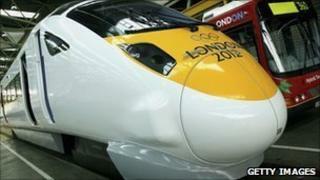 Nearly 4,000 additional services will run during the Olympics and Paralympics, according to Network Rail. Prices for the rail tickets, which can be bought from a dedicated website, have not been released. The London Underground will also have more services and run later. During the Games the normal morning and evening peak hours - when operators run trains with more carriages, at a greater frequency - will be extended. A third peak time will also be introduced when the Olympic Park in Stratford, east London, or other venues, close. Network Rail said services would run with more carriages than normal throughout the day, in and around London. More carriages will also be added to services in the hours before and after events at host cities around the country. And a number of additional early trains will run, at full-length, from major cities to ensure spectators can reach London in time for events with morning starts. The biggest boost for services in the Olympic timetable will be the number of additional late-night services for spectators to get home after events. In many instances trains from London to major cities will leave several hours later than usual. High speed Javelin trains will also run from St Pancras to Stratford. David Higgins, chief executive of Network Rail, said: "Our job during Games time is to provide smooth, seamless journeys for spectators travelling to and from Olympic and Paralympic venues, whilst continuing to offer the service which keeps millions of people moving across Britain each day." Hugh Sumner, Olympic Delivery Authority director of transport, said: "Longer, later and more frequent trains are being provided to ensure as best we can that spectators are able to get to their events on time and get back home afterwards - even if they decide to stay for a bite to eat or a sports session overruns." Only people with event tickets will be able to buy the 2012 Games train fares. The Tube will run around an hour later than normal during the Games and extra Tube services will also run later in the evening on the Games' busiest days. This will see the last trains leaving the Olympic Park at about 0130 and central London about 0200. Details of the special fares for 2012 ticket-holders and the final timetable is expected to be released at the end of June, Network Rail said.